After the fires, who will pay for damage? 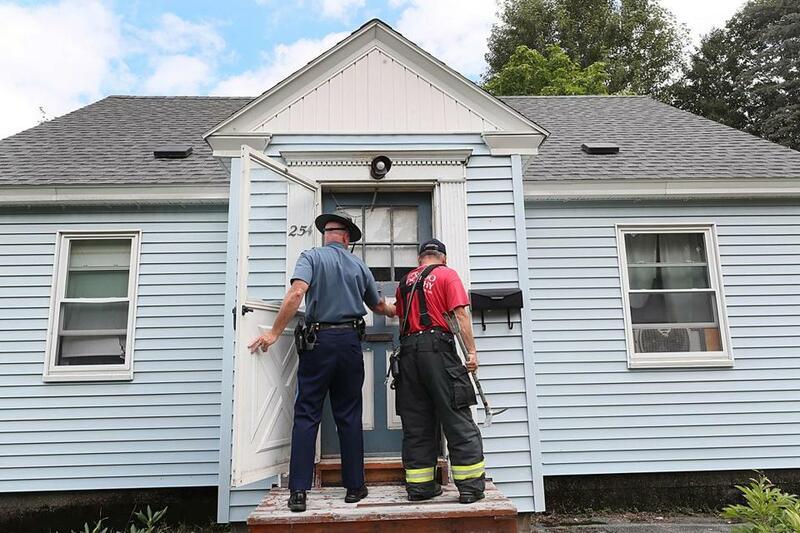 Firefighters and law enforcement personel accompanied Columbia Gas workers on Pleasant Street, in North Andover, on Friday to gain access to homes via locksmiths and going in through windows, to get check for gas leaks and to lock down the gas meters. Thousands of Massachusetts residents woke up Friday morning with the same urgent worry: Could the explosions that rippled through the Merrimack Valley on Thursday happen to me? Without warning, in the late afternoon, ordinary gas lines — the kind that fuel stoves and furnaces — suddenly turned into deadly hazards, spewing out overpressurized gas that triggered dozens of fires and led to the tragic death of 18-year-old Leonel Rondon. The first and most important step is for federal investigators to get to the bottom of how the explosions occurred. Local gas distribution systems have — or, anyway, are supposed to have — multiple safeguards to prevent a single mishap from cascading into such a huge emergency. The utility company that operates the gas system in the area, Columbia Gas, a subsidiary of publicly traded NiSource, said it hadn’t identified a cause of what appear to be multiple failures. Keith Holloway, a spokesman for the National Transportation Safety Board, said a team of about 10 investigators was already on the ground and an inquiry would take 12 to 18 months. The findings will be made public, and will include safety recommendations. That may seem like a long time, but it’s worth getting it right. But that doesn’t mean state and local officials here should step back and wait. Quite the contrary, they need to play an active role supporting the NTSB investigation. That’s especially true for the state’s Department of Public Utilities, which should also be aggressively using its power to assess fines and order safety measures at Columbia Gas or any of the state’s other utilities. Being proactive would go a long way for an agency that has been criticized for being cozy with the industry. If warranted, affected localities should also take a page from San Bruno and pursue legal action against Columbia Gas; the California city reached settlements totaling $120 million against Pacific Gas and Electric. Longer-term fixes, including any needed regulatory or legal reforms, will depend on what NTSB investigators unearth. One topic likely to come under scrutiny is the sheer age of the Commonwealth’s energy infrastructure, some of which still consists of 19-century cast iron pipes. In a 2017 regulatory filing, Columbia Gas said it still had 471 miles of cast iron mains, which are intermediate-size pipelines, and at least 250 miles of mains dating to before World War II. In 2014, the state passed a law designed to hasten replacement of old pipes. Columbia Gas was reportedly upgrading its lines on the day of the explosions. It filed plans for further upgrades under the 2014 law, but it’s worth asking whether that work needs to be sped up. Still, just age shouldn’t have caused the overpressurization. Even if the mains themselves are antiquated, the pressure control systems typically aren’t. If investigators determine safety measures were inadequate, the DPU will need to act. And if the fines and punishments available to the DPU are inadequate, the Legislature should explore stiffening them . So far, at least the state is showing who’s boss. On Friday afternoon, amid widespread public frustration, Governor Charlie Baker took the unusual step of authorizing the DPU to put Eversource in charge of the response in Lawrence, Andover, and North Andover, effectively booting Columbia Gas from its own business.